It was finally time for the last major destination of of our journey. 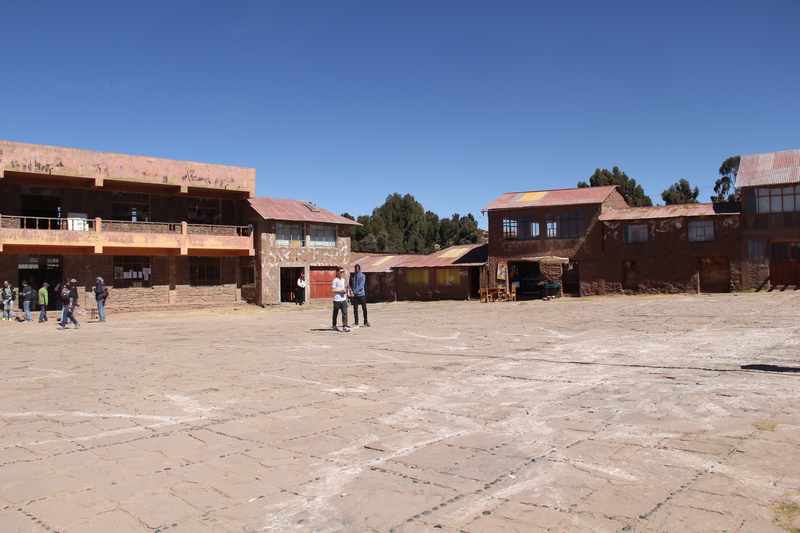 We had saved the remote, 12,000-foot Puno for last. 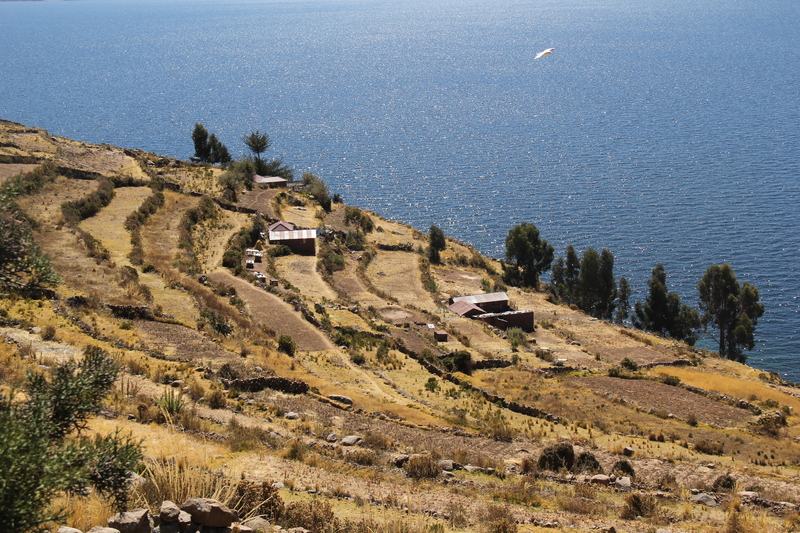 To my knowledge, there are three ways to get to Puno: A bus, a train, or a plane. Since we didn’t have 8-10 hours to spend on the road we opted for the latter. 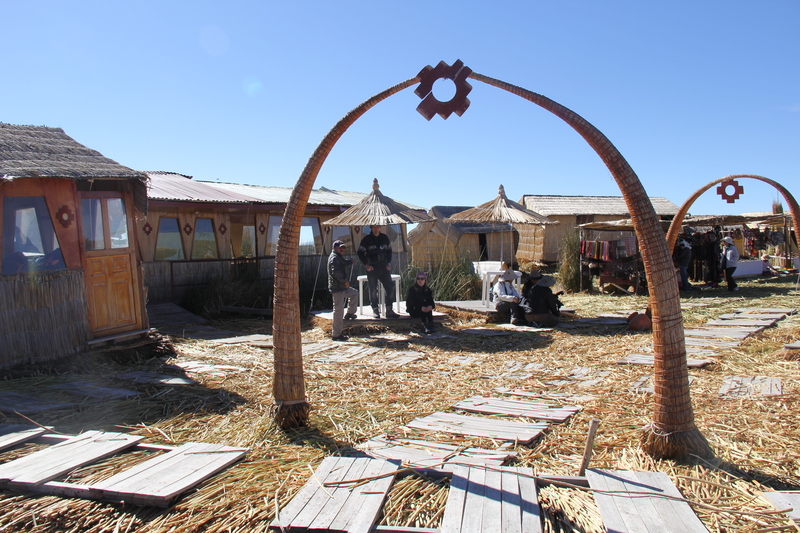 It was a quick one and a half hour flight from Cusco’s tiny airport to Juliaca’s even tinier airport. 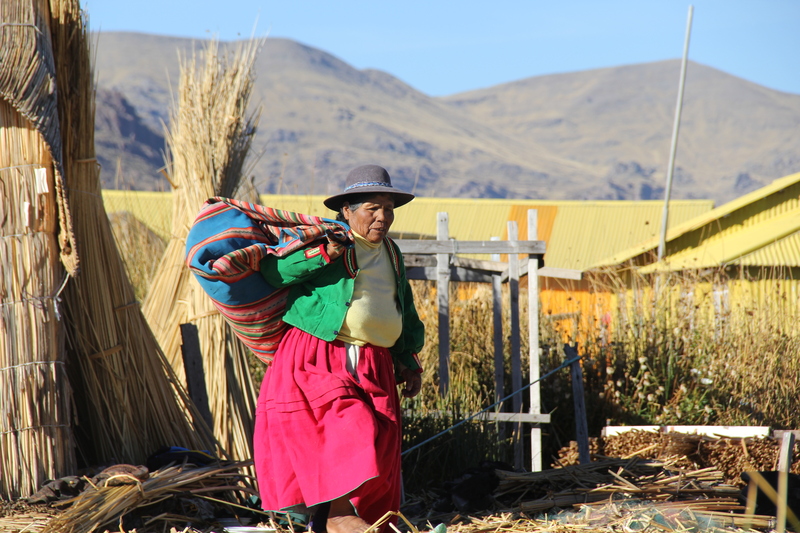 Note: If you are flying to Puno, you will land in the seedy and mildly terrifying down of Juliaca, about an hour’s drive from Puno. All the blogs I read beforehand were unambiguous in their advice to get the hell out of Dodge (Dodge being Juliaca), and from the little that we saw as we drove through it, I’d have to agree. 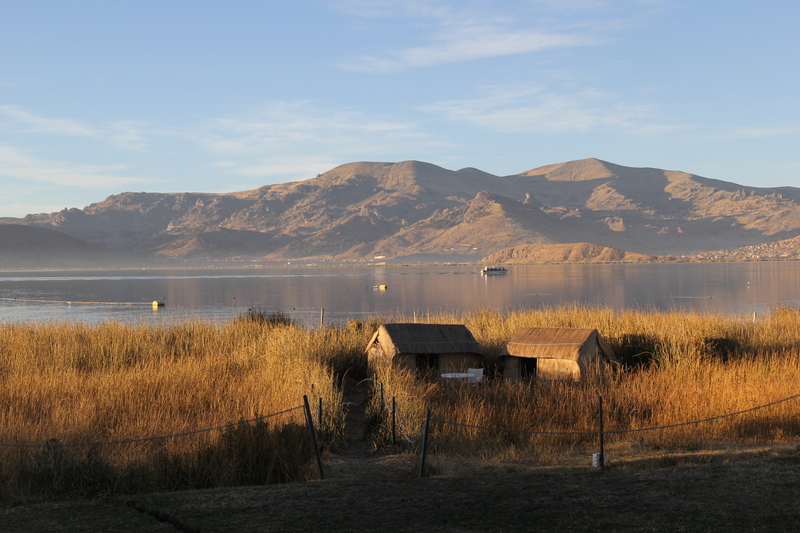 We chose a hotel on the water, and it was pretty nice to wake up to the views of Lake Titicaca – the worlds highest navigable lake. 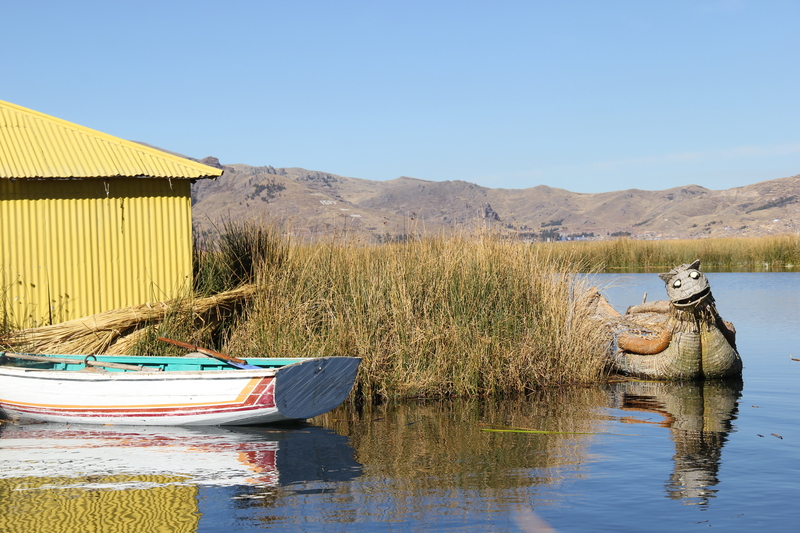 For those who are curious, we asked our taxi driver what in the world that means — what the heck is a navigable lake? 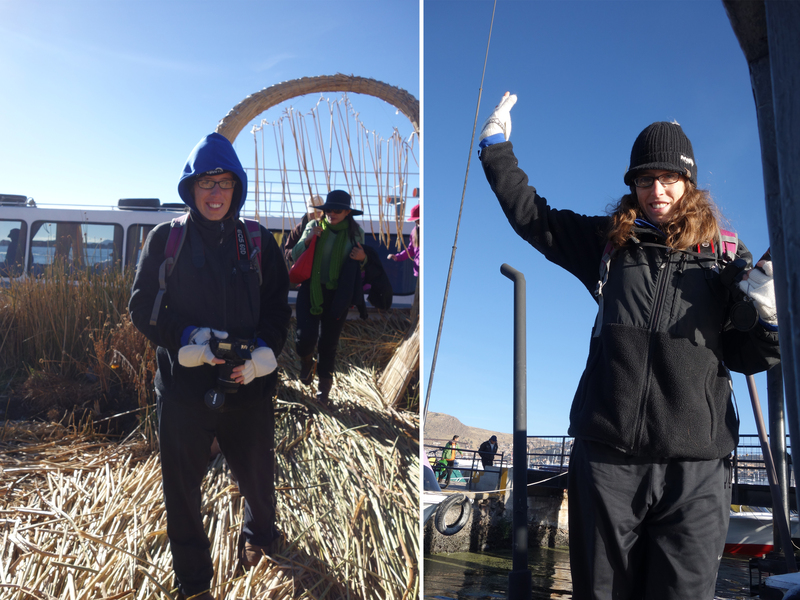 He informed us that Lake Titicaca never freezes, despite its high altitude, and thus, it is navigable all year round. 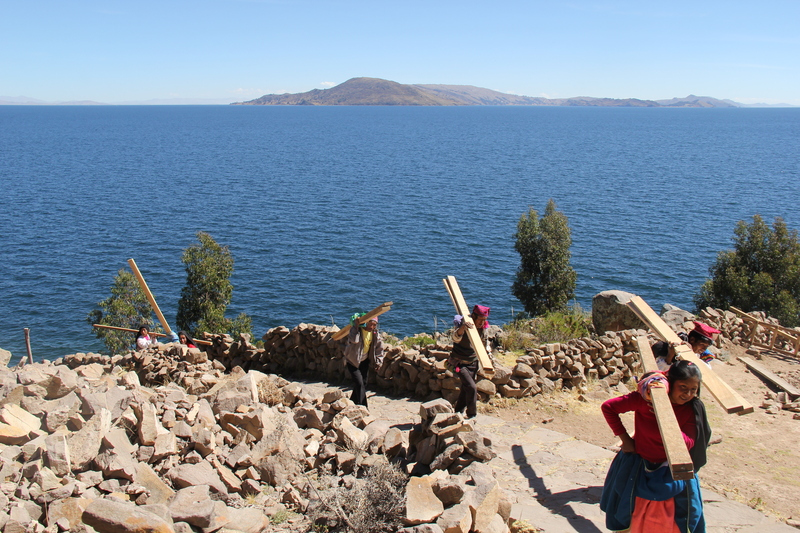 To which I replied: “So really, we should call it ‘the world’s highest perpetually navigable lake? '” and he laughed. Sometimes, I crack myself up. The beautiful view from our hotel. We went to bed early to wake up at 6 a.m. for our 6:45 pick up. 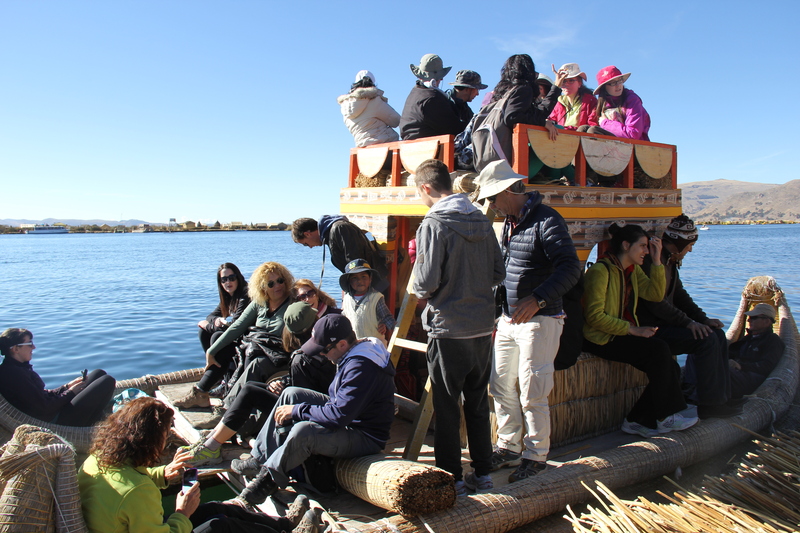 I wish I could tell you that we did a lot of research and picked the best tourist company for the obligatory Lake Titicaca tour, but they all looked more or less the same and we blindly chose one. But I can tell you without any doubt that at 6:45 a.m., it was cold. Not a little chilly, but really, honestly cold. That’s why I’m dressed like this. Of course, by noon, the sun was bright and strong, and even though I started shedding layers, I was a sweaty, sweltering mess. So much for planning. 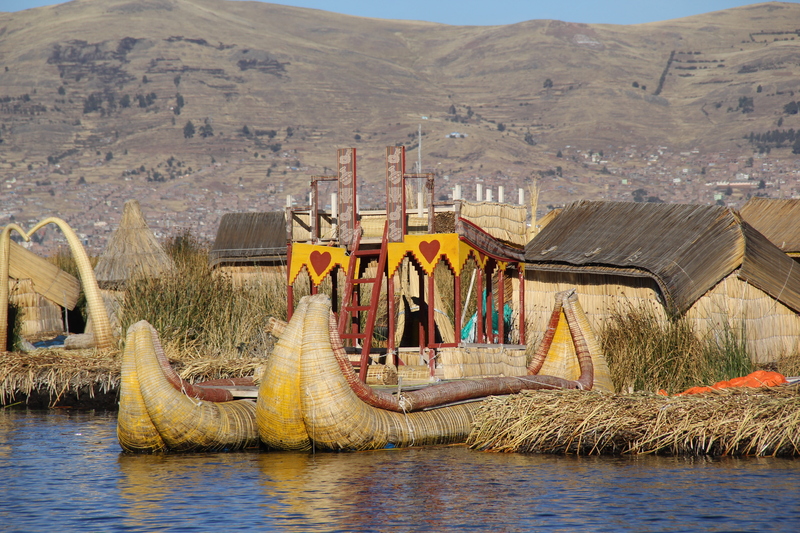 The boat ride to our first stop, the famous Uros Islands, took about an hour in the fast boat. 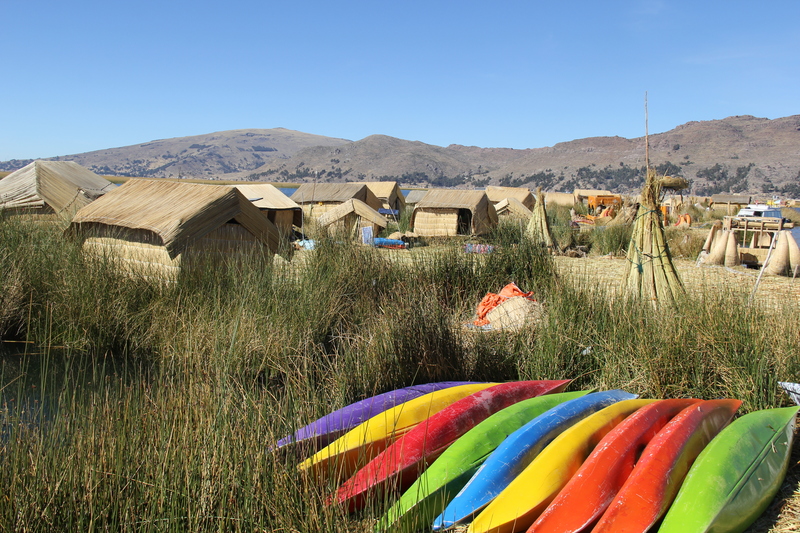 The Uros Islands are inhabited by natives who have their own language and traditions and dress in traditional Peruvian garb. 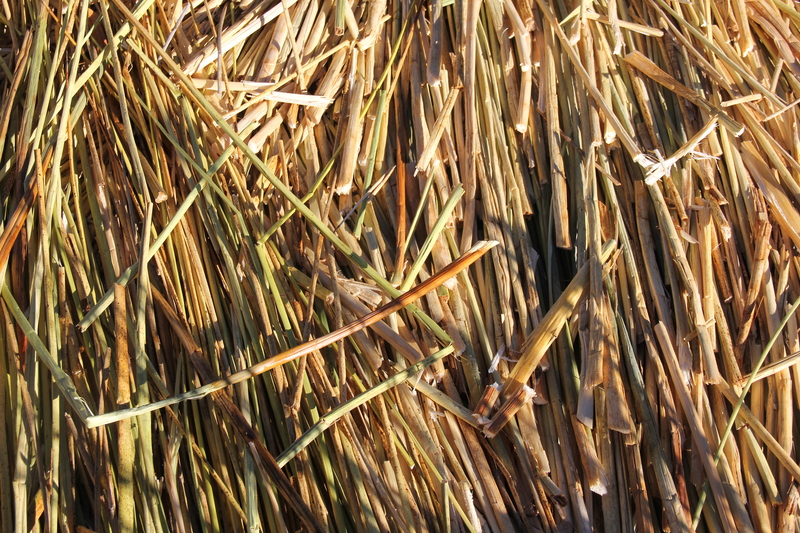 The islands are famous for being made entirely our of the reeds that grow in the water. 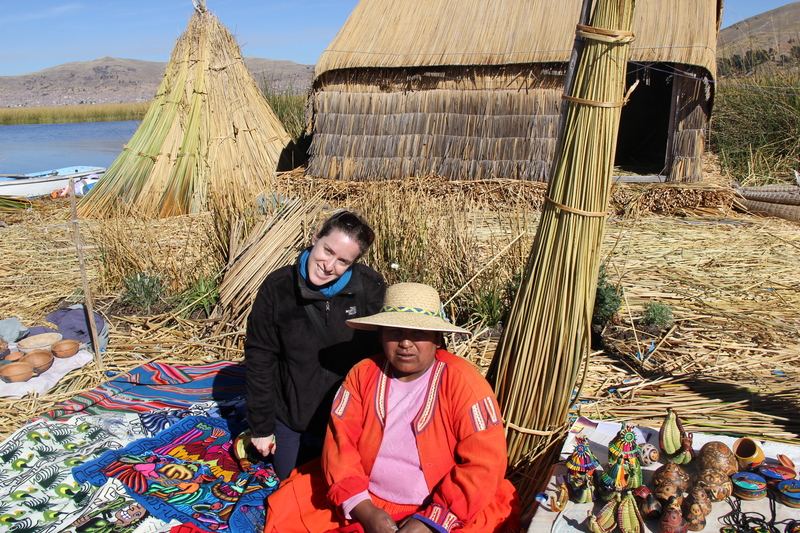 Once we arrived at the first island, we sat on reed benches while our guide and a local Uros resident explained a little bit about their culture and their way of life. 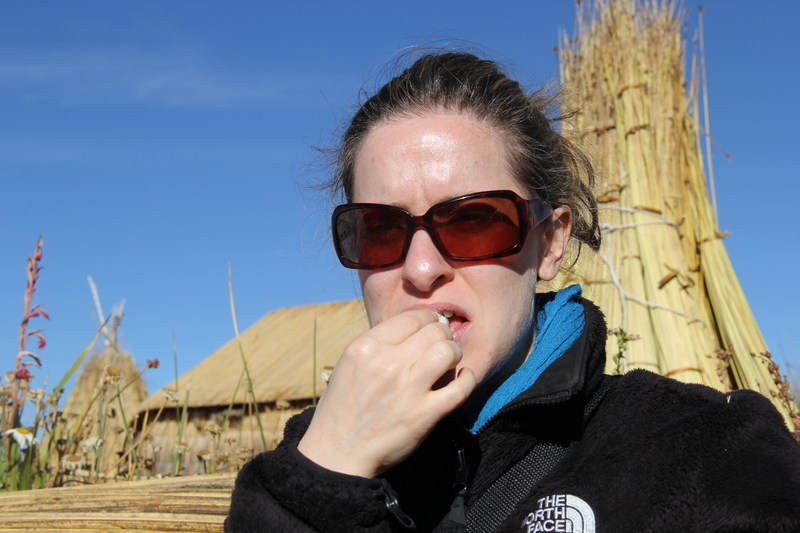 Apparently, you can eat the reeds – but only eat the bottom part or you may end up spending a lot of unwanted time in the bathroom (according to our guide – I am not speaking from experience!). Lisa was braver than I. Here she is tasting the reeds. 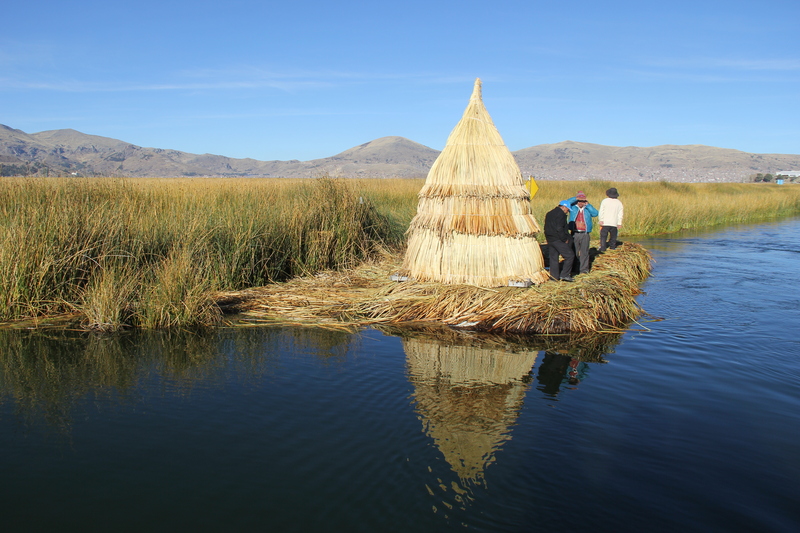 After about 10 minutes of wandering around, we boarded a reed boat and zipped off to another floating island, where we had our passports stamped. 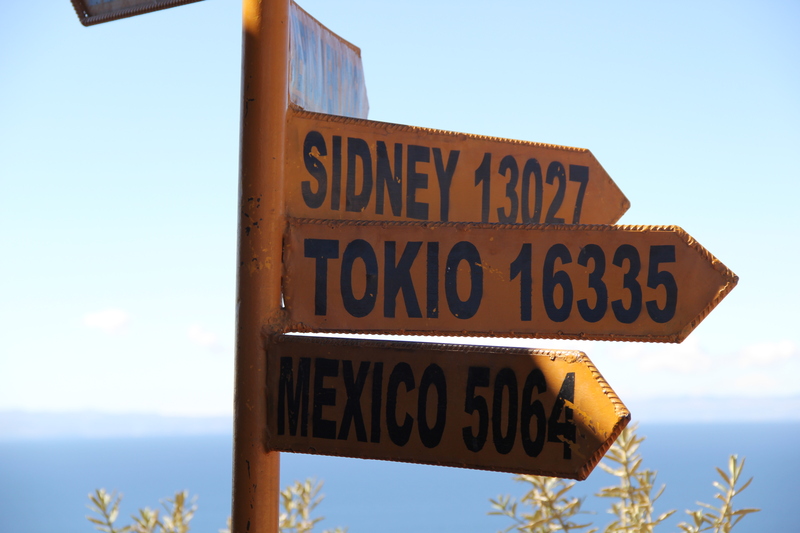 Note: Entrance to the islands and the boat ride coast 10 soles and stamping your passport costs an additional sole. If you’re inclined, there is plenty of opportunity to purchase souvenirs and multicolored trinkets. Lisa purchased one of these lovely hanging thingies. 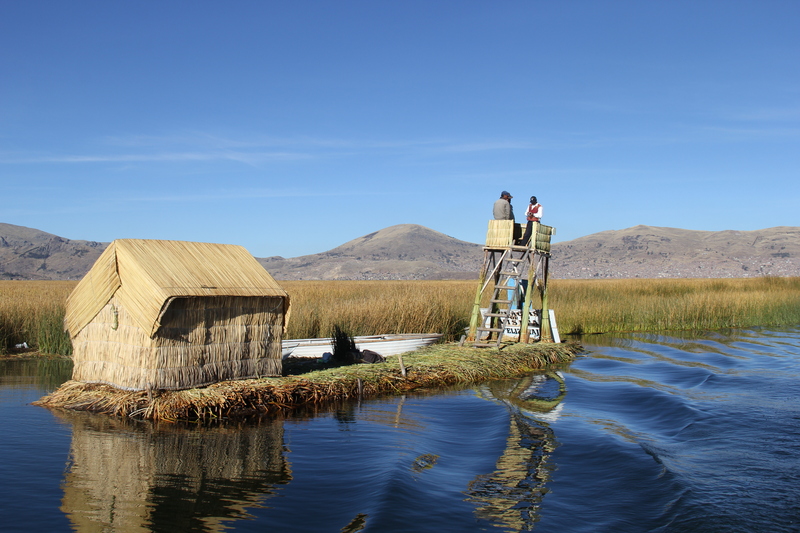 Our boat picked us up from the second island and we zipped off to Taquile Island, which is inhabited by Taquileños, who like the Uros natives, have their own tradition, culture and practices. 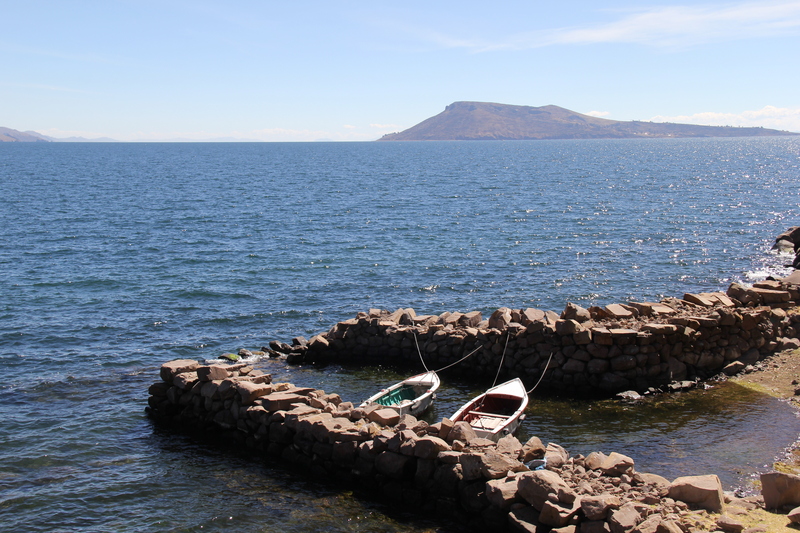 I fell asleep on the ride to Taquile so I can’t actually tell you anything about the journey, but when I groggily stepped off our boat, I had one of those “oh wow…” moments. The sky was so blue and the water even bluer. 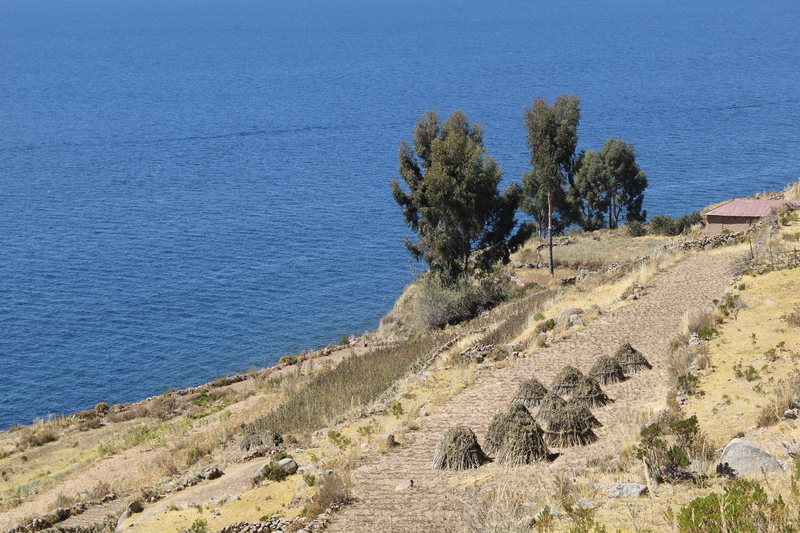 And as we hiked up to the top of the island, the views got bluer and more beautiful. 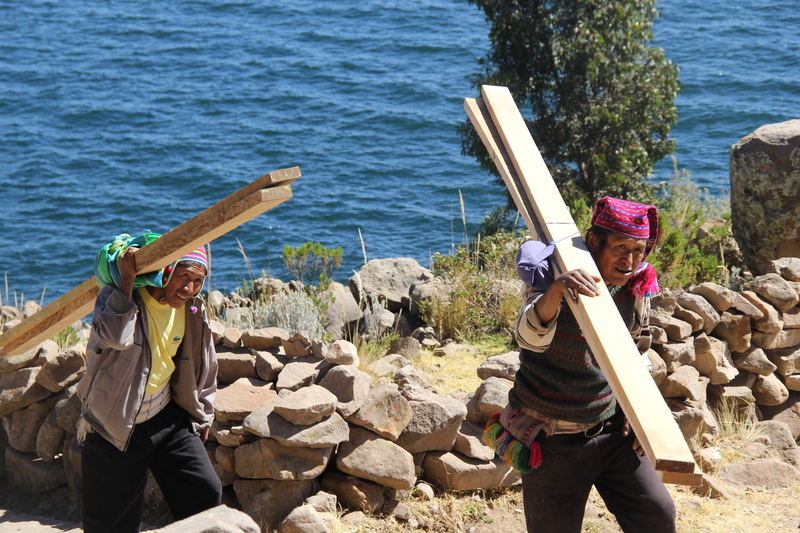 I was consistently impressed with the parade of natives carrying plywood up the mountain on their backs. I wasn’t carrying much of anything and I was huffing and puffing. But for them, this was just regular life. At the top of the mountain, we stopped to catch our breath in the town square. It’s not a particularly happening spot, but we learned later that this is where all the important town meetings and gatherings takes place. 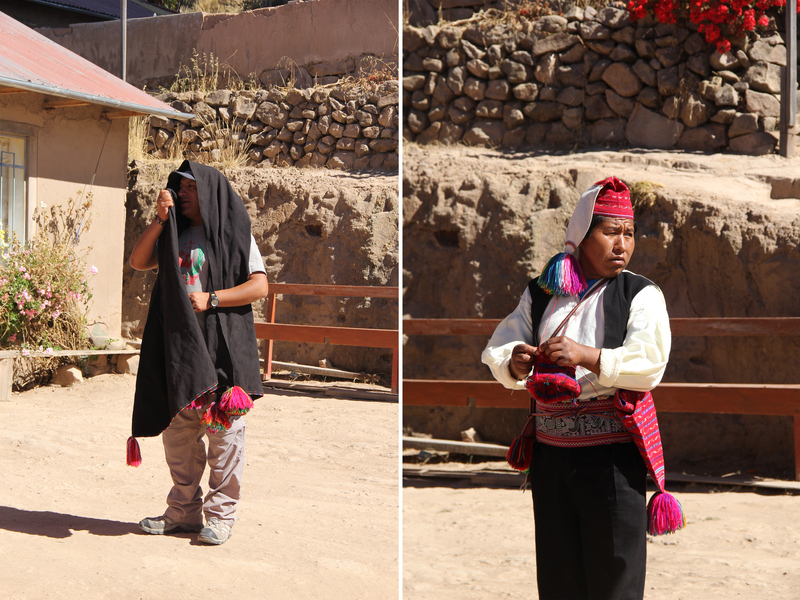 During lunch we received a crash course on the intricate practices of the Taquileños. 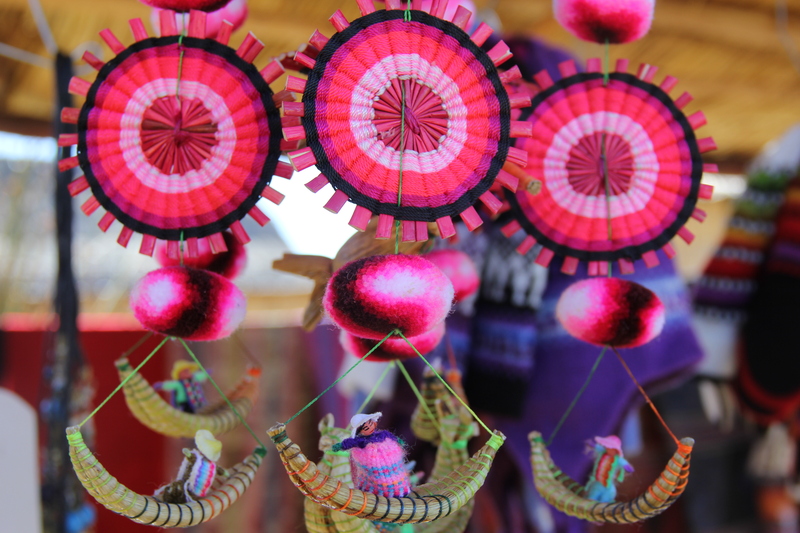 The Taquileños are known for their brightly knitted hats and scarves, but these colorful items serve a utilitarian purpose. There are different hats for single men, engaged men and married men, and different hats for single women and married women. 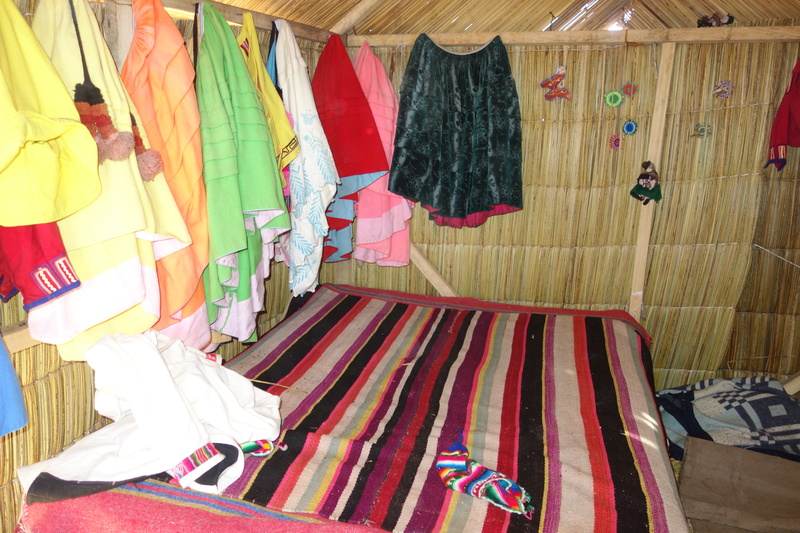 The position of the scarves’ tassels are used to indicate whether a person is happy or sad, and if they are sad, one of the councilmen will approach them and solve their problem. If only my problems could be solved that way. 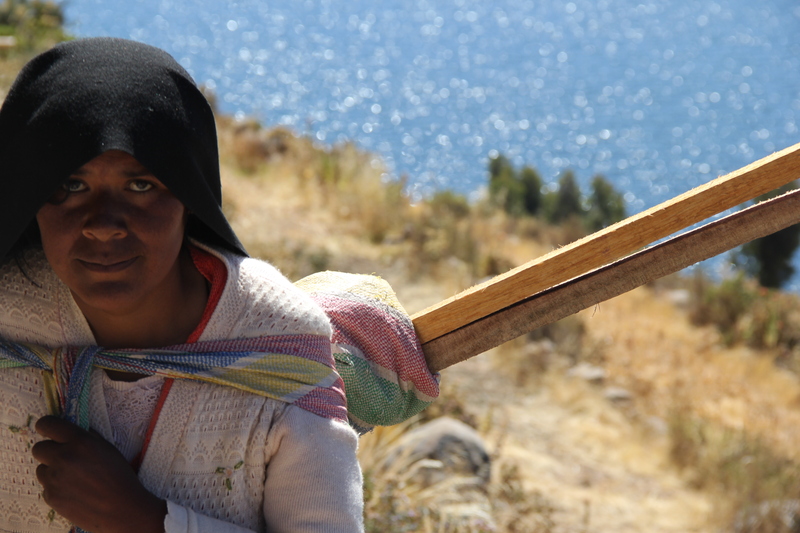 The Taquileños are incredibly self-sufficient, relying on the island’s natural resources to get by. 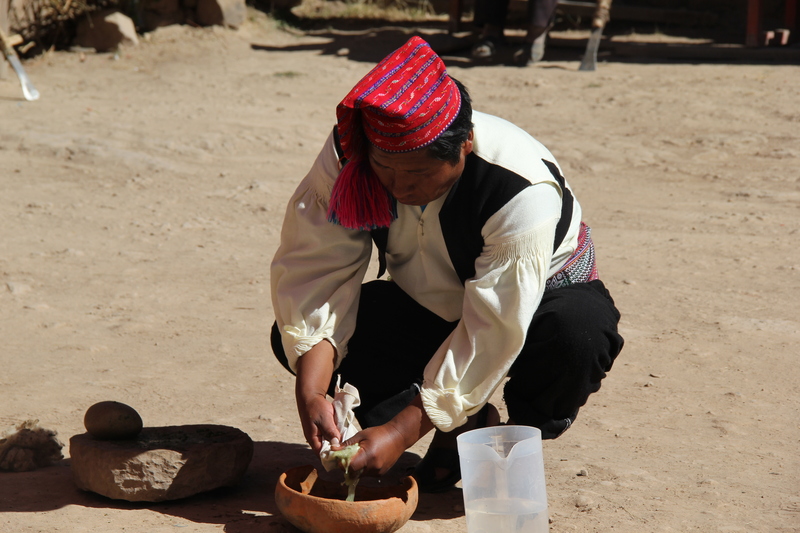 In the below picture, a man demonstrates how they make soap out of a plant. 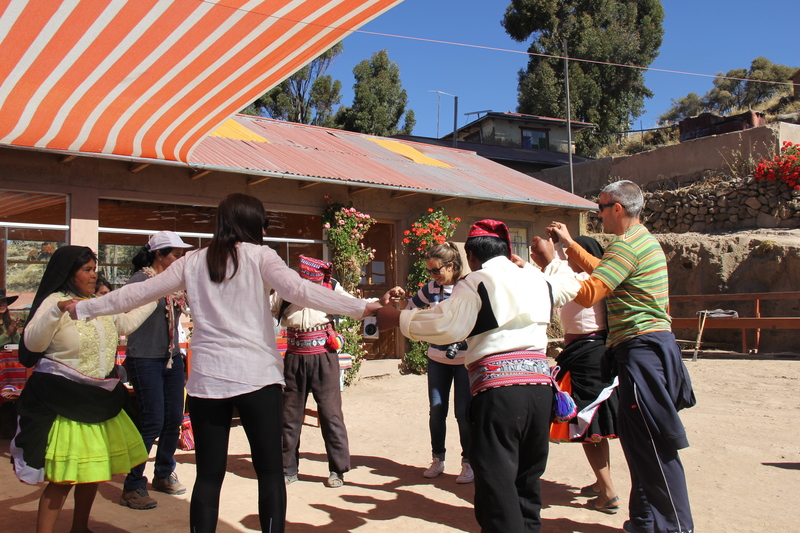 Finally, the island’s natives demonstrated a traditional Taquile dance for us, even pulling in members of our tour group. 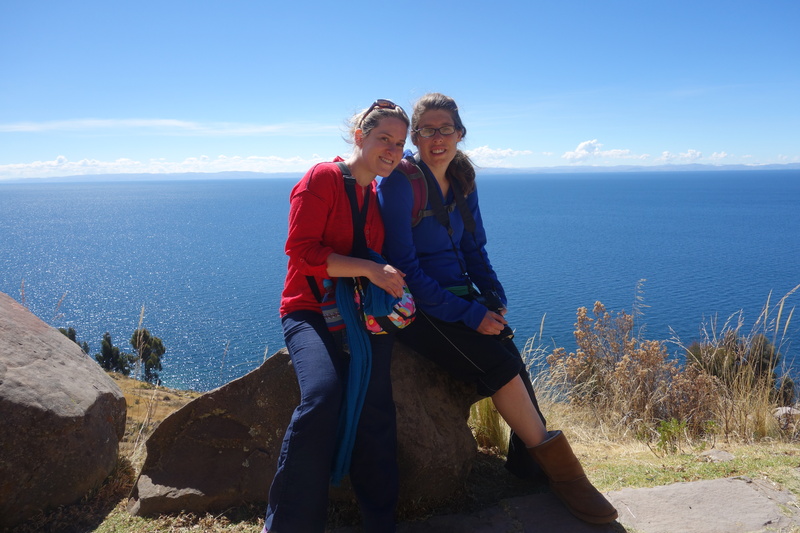 Lisa and I both really enjoyed Taquile Island, though I think I would have enjoyed it even more if I wasn’t so tired. 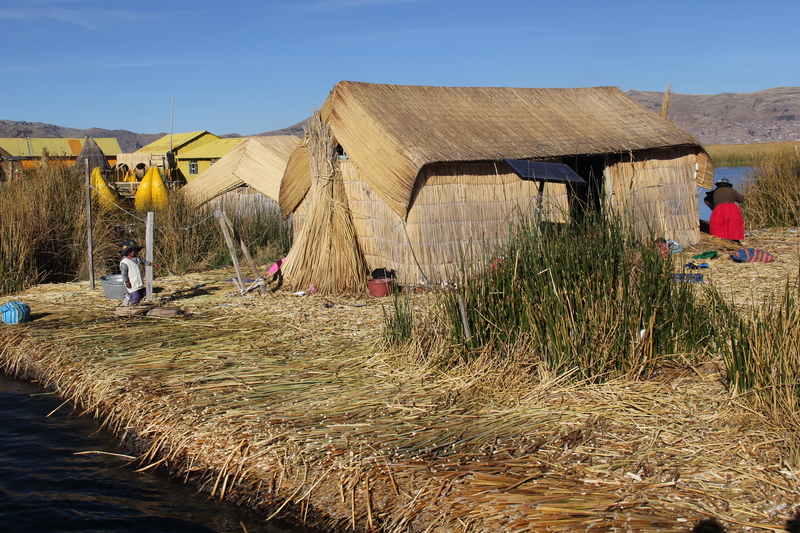 Most tourists we met in Peru gushed over the Uros floating islands, but I thought the commercialization of them detracted from their beauty. 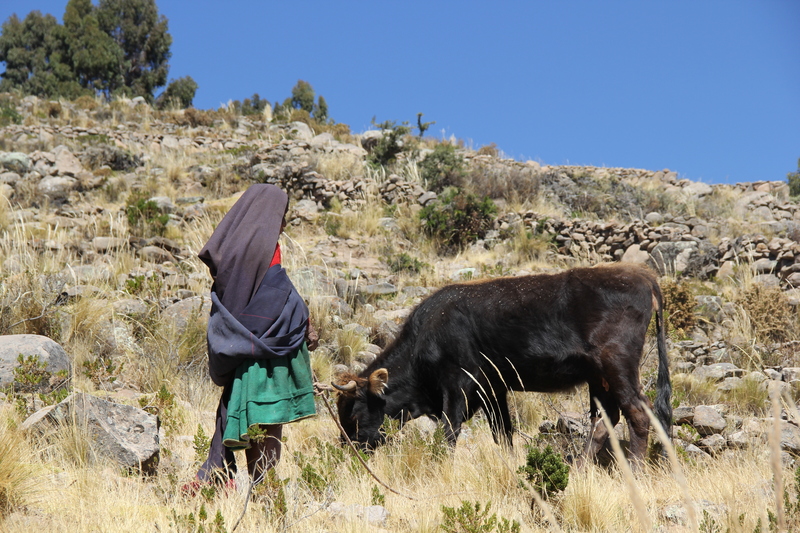 In contrast, Taquile had a purity about it. 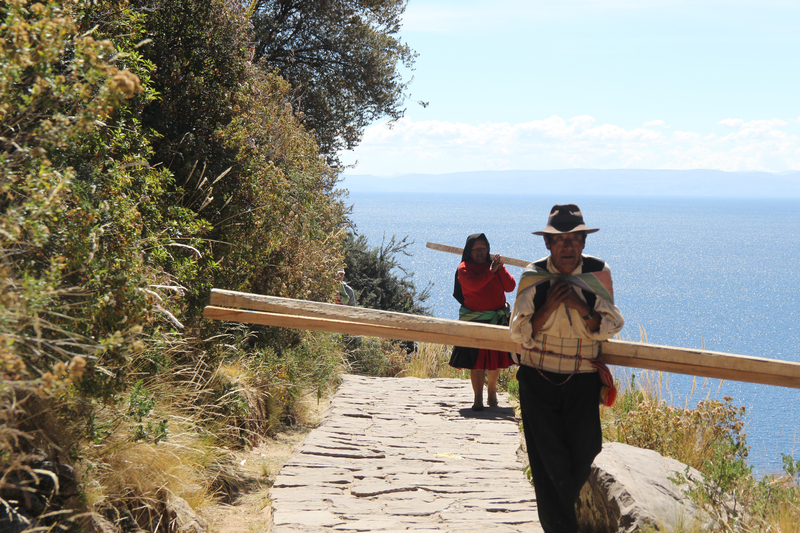 There weren’t throngs of tourist groups or natives selling souvenirs at every corner. It was just a beautiful hike up a mountain under a startling blue sky, engulfed by the wold’s highest perpetually navigable lake.